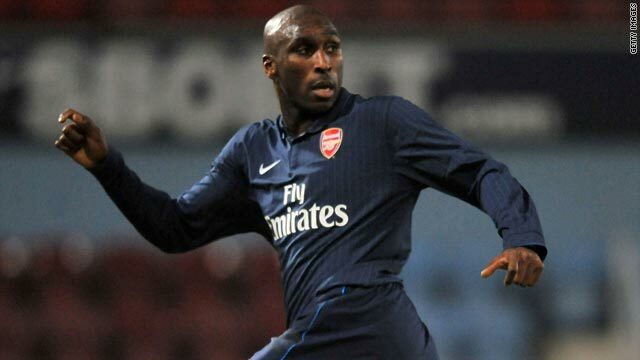 Sol Campbell in action for Arsenal's reserve team against West Ham on Tuesday night. (CNN) -- Arsenal manager Arsene Wenger is expected to break one of his golden rules by re-signing former England defender Sol Campbell. The Frenchman has never brought one of his old players back to the English Premier League club, but the Londoners have confirmed that free agent Campbell is in contract talks. The 35-year-old, who left Arsenal to join Portsmouth in 2006, played for the Gunners' reserves team in Tuesday night's match at West Ham. He made a shock move to join lower league side Notts County on a five-year contract in August, but quit the club after playing only one match. Sky Sports reported that he would be signing a six-month deal with Arsenal, with whom he won two league titles and three FA Cups in a five-year stint following a controversial move from north London rivals Tottenham. He would provide cover for first-choice central defenders William Gallas and Thomas Vermaelen, meaning a likely exit for Switzerland international Philippe Senderos. "Tonight's reserve team to face West Ham United at Upton Park features Sol Campbell, who plays on a Reserve League registration," read a statement on Arsenal's official Web site on Tuesday. "Talks are ongoing with Sol with a view to a permanent move back to Arsenal." In other transfer news, Premier League side Birmingham have completed the signing of Spanish midfielder Michel from Sporting Gijon for $4.8 million. The 24-year-old has signed until 2012, while Ecuador defender Giovanny Espinoza has had his contract canceled by mutual consent after struggling to make an impact at Birmingham following his move from Barcelona in June. Wigan have signed Ivory Coast international defender Steven Gohouri, who follows Serbian goalkeeper Vladimir Stojkovic as the club's second capture of the January transfer window. The 28-year-old, a free agent after leaving German side Borussia Monchengladbach in December, was not selected for the Africa Cup of Nations tournament in Angola this month. Spanish club Atletico Madrid have signed 19-year-old striker Eduardo Salvio from Argentine side Lanus for $11.5 million according to sports newspaper Marca. The 19-year-old replaces Florent Sinama-Pongolle, who joined Portugal's Sporting Lisbon earlier this month, and is the team's second signing of the window after the arrival of Juventus midfielder Tiago. German club Schalke have agreed a deal with Bundesliga rivals Mainz to re-sign defender Tim Hoogland at the end of this season on a four-year contract. The 24-year-old is captain of Mainz, who he joined in 2007, but will be a free agent in the European summer. "Mainz was the best thing that could happen to me, but Schalke is my homeland club. I simply had to take notice of this opportunity," he told the Royal Blues' Web site. Russian club Zenit St Petersburg have signed Danish defender Michael Lund on a three-year contract from Aarhus. The 22-year-old made his debut for the Danish Superliga side when he was 17. England: Manchester United may have to sell star striker Wayne Rooney in order to reduce the club's debts, according to The Sun. France: Bayern Munich's France playmaker Franck Ribery has suggested that he will decide between a move to Real Madrid or Chelsea before the World Cup finals in June, according to French channel Stade 2. Italy: Roma defender Cicinho is poised to return home to Brazil with a loan move to Sao Paulo, reports the Gazetto Della Sport Web site. Germany: Former Germany striker Kevin Kuranyi, who has been linked with a move to England, has decided to stay with Schalke according to newspaper Bild.